The Coconino sandstone at Grand Canyon means many things to many people. To the hiker, it indicates that he or she is almost at the top. To the artist, it is a graceful sweep of sculptured stone, and to the geologist, it evokes the trade winds blowing across Aeolian dunes 265 million years ago. But to the graffiti punk, it is a blank canvas. It’s a snap to scratch names, drawings and dates into sandstone. Fortunately, most of the time it is easy to erase the same, using water, a scrub brush and some occasional blue language. For vandalism that’s not as easily removed, such as marks made by paint or with black or colored markers, park rangers have more powerful tools at their disposal, using rock-colored resin mastic to cover the panel, for example. In the worst cases, however, sometimes they end up having to cut out part of the rock. Graffiti is surging at Golden Gate National Recreation Area, Joshua Tree, Arches and Zion national parks, and Glen Canyon National Recreation Area. At Capitol Reef and Independence Rock, ignorami scrawl their names over 100-year-old pioneer inscriptions. Even 4,000-year-old drawings from the Archaic Period have been scribbled on. A sign in Canyonlands National Park. Some pieces of “art” are so elaborate, you have to wonder that no one was caught in the act. One gentleman composed a 200-word eulogy to his late wife on the South Kaibab Trail – lovely sentiment, wrong place for it. Patriotic hikers executed a 4-by-6-foot Swiss flag. Park Service policy is to remove such vandalism within 24 hours. Unmolested graffiti invites others to leave their mark. Not to mention that it is ugly. Why do they do it? One tourist explained, “If I don’t write my name, how will anyone know I was here?” Sometimes foreign visitors express amazement that graffiti is prohibited. One Canadian perpetrator explained that the place was so beautiful he wanted to bring his grandchildren back to show them where he had spray-painted his name. The Park Service was not sympathetic. But technology works both ways. Some parks have installed hidden video cameras, and the Park Service has a visual database that enables it to compare graffiti across parks. This has allowed the parks to occasionally track down wide-ranging vandals. What is the difference between historic inscriptions and graffiti? Pioneers trudged across the country to settle in the back of beyond with no water, no food and no support. Some signed their names on the rocks at Capitol Reef, signaling their survival. These days, tourists drive, park and walk almost a whole mile. After this horrendous ordeal, they sign their names. Nope, I don’t buy it; I know who the real pioneers were, and you are not pioneers. Native Americans tell us that rock art sites are not abandoned sites. They are law books, story locales and places of power. Even now, young men will spend the night nearby, seeking visions. “I heart Grand Canyon” is not vision-inducing. Fans of graffiti as art argue that if Picasso or Monet painted on a wall, we would consider it a masterpiece. Critics of this view counter that if initials scrawled on a wall count as art, an overflowing trash container may also be considered art. Wilderness was defined by law in 1964 as “untrammeled by man, where man himself is a visitor who does not remain.” Graffiti is trammeling. If you’re in a public space and you didn’t get permission to change it, that’s vandalism. My acquaintances and I share a common fantasy of catching one of these clowns in the act. We have imagined elaborate scenarios of revenge, from scratching a name on the vandal’s car to spraying “Hayduke lives!” across a perpetrator’s shirt. Actually, I have caught people in the act. Small children I simply admonish: “This is a national park and it is not fair to spoil it for everyone else,” I say. I am less polite to adults; I tell them that it is obvious they don’t hike much, because experienced hikers know better. Recently, I came across a young tween who was industriously drawing on a flat rock. I produced my squirt bottle and brush, erased the offending intaglio and advised her that graffiti is not only illegal but also unsightly and rude. Then I continued on my way. When I returned, I realized that she had reproduced the drawing on the same rock. Next time I will dislocate her little thumbs. Marjorie “Slim” Woodruff is a contributor to Writers on the Range, an opinion service of High Country News. 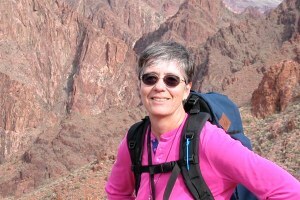 She is an educator in Grand Canyon National Park.